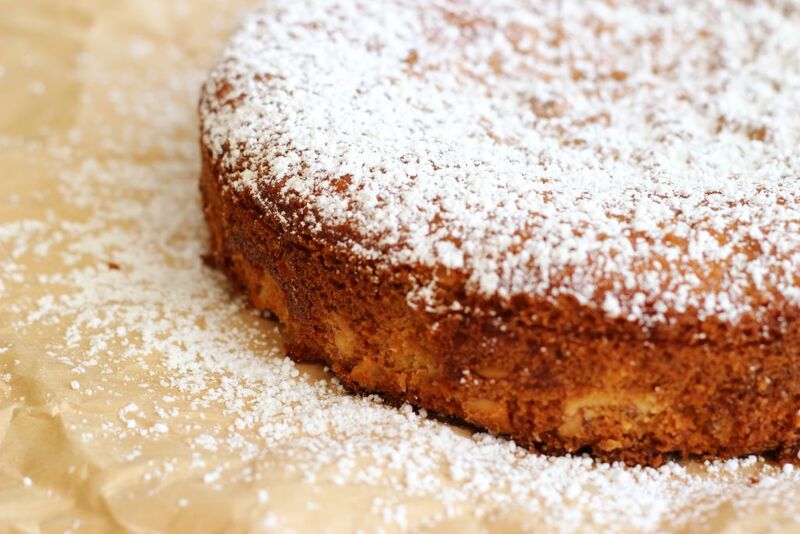 A rich and moist, but fluffy and light citrus almond olive oil cake. 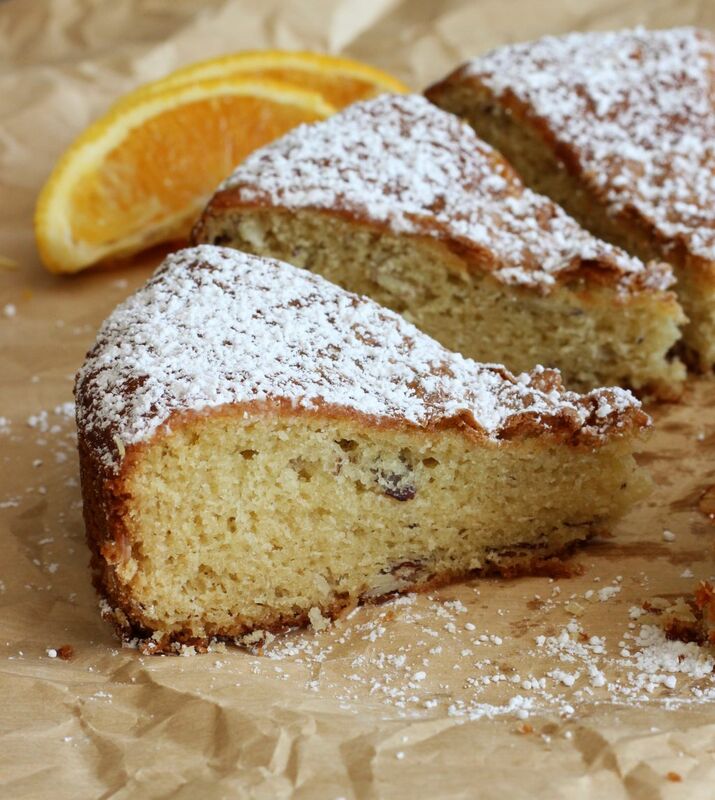 This Citrus Almond Olive Oil Cake is full of flavor and easier than you’d think! We are going out of order with things here. 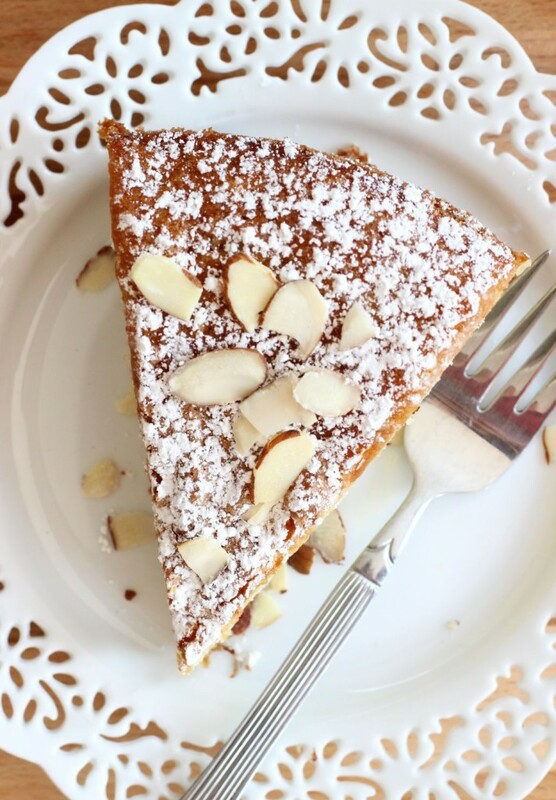 I had something more seasonal on tap to share next, but even the best laid plans… so instead, you’re seeing this Citrus Almond Olive Oil Cake first. As some of you may have seen on Instagram, I’m visiting family this week in Pennsylvania. I worked ahead so I’d still have posts for you though! I got out my laptop yesterday morning to put finishing touches on a post, and no sooner had I sat down with the laptop in hand, my mom’s dog, who weighs about 50 lbs and isn’t exactly a lap dog, jumped up on my lap and knocked over a cup of coffee next to me, spilling it all over the entire keyboard. Aaack! I was in shock. I couldn’t believe how fast it all happened. Once I came to my senses and starting cleaning up, then I went into kind of a sad stupor and just laid back in bed for an hour. #drama. I’m praying that the hard drive isn’t fried. I will know more when it dries out, but it’s quite an unexpected snafu! So instead of seasonal, today I’m sharing this Citrus Almond Olive Oil Cake that I probably needed to show you soon anyway since I made it weeks ago! One of our favorite Italian restaurants here in Tampa has Olive Oil Cake on the dessert menu and up until a few years ago, I didn’t know such a thing existed. Since my first introduction to it, I’ve seen citrus versions and almond versions, but never both together! I had to make this Citrus Almond Olive Oil Cake. The essences and subtle flavors of the olive oil blend beautifully with the citrus and almond flavors. 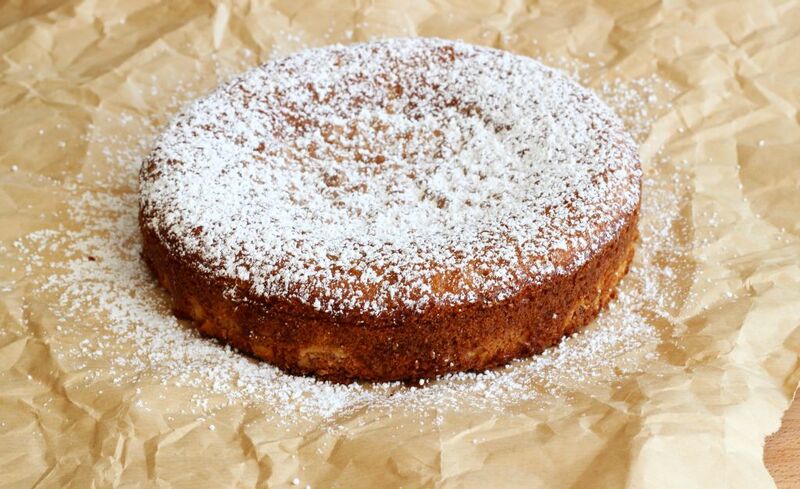 This Citrus Almond Olive Oil Cake is also a very rich and smooth cake, while still be light and springy, not heavy. Rich, yet somehow delicate. I’m such a huge fan. Enjoy it for dessert or even for breakfast with a tall mug of coffee. Or a short, stout mug of coffee. But definitely coffee. 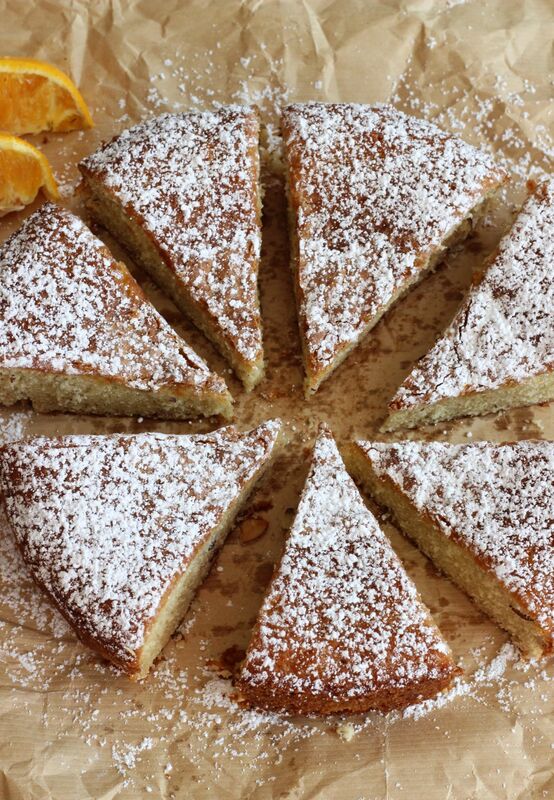 A citrus and almond-infused olive oil cake. The flavors of this cake are so incredibly unique and wonderful! Lightly grease a 9-inch springform pan. In a small bowl, mix together the buttermilk, lemon juice, and orange juice; set aside. In a large mixing bowl, beat the eggs and granulated sugar at high speed until pale and fluffy, about 5 minutes. Lower the speed to medium-high, and drizzle in the olive oil slowly, beating until incorporated. 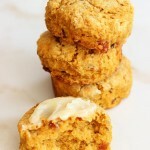 Mix in the lemon and orange zests (of if using extracts, add them to the buttermilk mixture). With the mixer on low, add half the flour mixture until incorporated. Add the buttermilk mixture next, then the remaining flour mixture, until just blended. Bake at 350 for 40-45 minutes, or until the top is golden and a toothpick inserted near the center comes out clean. Let the cake cool in pan on a wire rack for 20 minutes, then carefully remove the pan sides and allow cake to cool completely. I hope your computer is ok, Sarah! Hopefully it just needs time to dry out. This cake looks incredible! I’ve never had an olive oil cake before, but have heard how delicious they are. 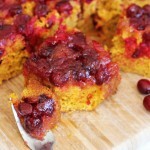 I love that you combined citrus flavors and almond to flavor this cake! Love how moist and fluffy this looks! Thanks, Gayle! It’s beautiful here in PA today, in the 60s, so we went to the lake and the dog got out of her harness, my mom has no idea how! So we just finished sprinting for 40 minutes trying to catch her. SHE IS TROUBLE, indeed. But, at least there’s CAKE! 🙂 Hope you’re having a great week! Ugh, that’s awful. Not the cake. That looks fantastic. But your computer maybe getting fried. That’s awful! Hope it’s okay. And I’m impressed that you managed to get so far ahead that you can post stuff while away. We’re heading to the States next week while my kids are on a break from school, and I’m just hoping I’ll manage to get some stuff ready to post! And that’ll probably only happen by posting a little less often than usual for a few weeks! Oh you’re coming to the States? How exciting! For vacay? Where are you guys going? Yes – the computer thing was awful!! The shell is shot, but the hard drive is okay! Thank goodness for that, at least! It’s definitely good to take blog breaks anyway, so take the time off and enjoy!! I hope you laptop is fine Sarah! The cake looks incredible, very soft and delicious. I love simple cakes minus the frosting so this is totally my type of cake 🙂 Pinned. Good luck with the computer! Not fun! This cake, however, very fun! It looks delicious!! Thanks for sharing! It’s a very beautiful and unique cake! Hi Winnie! Olive oil has subtle flavors that add to the cake really nicely, and keep it very moist and rich! I hope you try it sometime! Oh no! That’s such a bummer about your computer, hope it’s ok. This looks like a really delicious dessert. I found a recipe for an orange olive oil cake that I have made a bunch of times, so I cannot wait to try out this recipe. Stopping by from the Wonderful Wednesday Blog hop! Hi Bev! Yeah, it all happened so fast!! The hard drive is fine – thank goodness! 🙂 Thank you for stopping by from the blog hop! Have a wonderful evening! This sounds sooooo yummy. I made something similar with oranges and almonds. I found the recipe in my favorite Greek cookbook. Your olive oïl citrus cake sounds so delcious. I can’t wait to make it! Hi Krissy! Wow – thank you so much!! That’s so kind of you – I always feel honored to be featured. THANK YOU! 🙂 I’ll be back to the party this week, for sure! Hope you’re having a wonderful weekend! This is such a beautiful cake, Sarah! 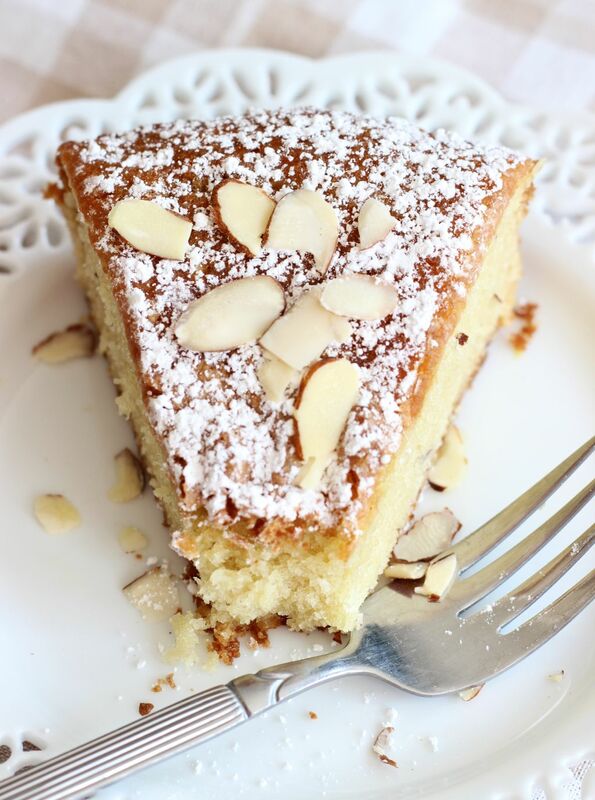 There’s an almond cake in one of my cookbooks that I’ve been eyeing for a while. I think your cake make have given me the push I need to make the cake! Thanks, Julie! This cake turned out delicious and looks pretty too. I just got back yesterday from visiting family so I’m settling in and about to hunker down to do a ton of baking today!! Perfect Sunday for it since it’s chilly and rainy here in central FL! Probably about the same in your neck of the woods. No better way to spend the day. 🙂 Hope you have a great weekend too! This cake sounds awesome and perfect for Christmas! Thanks for linking up to the Project Parade. I’m going to share it again tomorrow night as a feature. I have been wanting to make a version of this cake since last citrus season. It is on my to-do list. I am having sympathy pains for you over your computer. I hope it all turns out well. I had a lovely olive oil cake at a restaurant on a trip to California. It was so delicious! I can’t wait to try this one! Sarah this cake is beautiful! Love the citrus flavors in there. 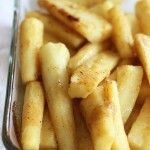 Thanks so much for linking up to SNF, Pinned! Thank you! I was happy that the photos came out well and the cake looked pretty! Tastes delish too, of course! 🙂 And thanks so much for the party, Serene! Your poor computer! Hope it’s salvageable!! I’d have gone to bed the rest of the day, too. Sarah: I made this shortly after you posted it; it was delicious and is definitely a keeper in my recipe book! Loved it, and so did my family! 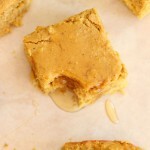 Although I usually don’t bake, your blog has now become my go-to website for desserts! Can’t wait to try one of the gingerbread recipes that you have posted in the last couple of days! Oh, great! I’m so glad you liked the cake, Becky! It’s got such unique and different flavors from the olive oil! Mine sunk a little bit in the middle last time I made it, but it tasted perfect! Thanks so much for letting me know how it turned out! I love to get feedback. 🙂 Happy Holidays to you and yours! Mmmmm. This is my kinda recipe!! Thanks for sharing it. This cake looks absolutely delicious! Well Done! This cake looks absolutely delicious! What wonderful flavors…it must taste awesome…thanks for sharing! Thanks so much, Jodee! Yes, it has an awesome flavor combination! Love this kind of recipe! Sounds luscious! Pinning to make soon! Sounds Italian too! Ahhhh. ……the beauty is cooling on my counter top at this very moment and the kitchen is fragrant with almond and lemon. Have had this before and always loved the lingering taste of flowery EVOO on my palate- its a must to use the best olive oil possible. We are looking forward to dessert this eve…..this lovely cake with some pretty red raspberries and maybe a glob of whip cream. Thank you for this recipe! Love the addition of the citrus and almond together to my norm of just a touch of almond. Blessings to you. Love your Blog. Oh great! I’m so happy to hear that you tried it! I hope you love it – please let me know how it turned out for you. I love olive oil cake. It’s so unique! The raspberries would be delicious on top! Well…….We cut the beauty and it was just as beautiful inside as out. Two nice large slices…..moist on the inside and the slightest crispy crust. A good size sprinkle of red raspberries and a dollop of whip cream and the hubby and I were in heaven- you have a 5 star recipie my dear. It will be made the next time I want to make a friend smile ………………or for my husband who is still groaning with happiness! THANK U SO MUCH FOR THAT wonderful cake! 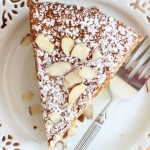 Love everything with almonds , I can’t wait to try this one! !! Thanks for sharing , let you know how it goes! !!! Yes – let me know if you try it! Thanks so much, Maria! This reminds me of a cake in Italy called Torta della Nonna! 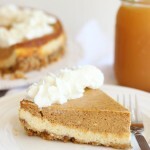 I am not sure how to make it but this looks similar and oh so good! Oh, that’s cool!! I have to ask my in-laws about Torta della Nonna! I’m sure they’ll know it! Amazing, amazing cake. This is now my go to!!! Love it so much. Thank you. I am about to make this cake but am confused about whether to use zest and juice. In the directions it says add the juice and later says add the zest. However the ingredient list makes it sound as if you use zest OR extract and juice, meaning you only use the juice if you use extract instead f zest. please clarify. Zest OR extract plus juice! I was also confused by steps 3 and 6. 3 says juice and 6 says zest or extract and juice. I would like to try this recipe. Please clarify. Hi there! You need a juice either way… you add that to the milk in step 3. Then for step 6, you can either use zest OR extract… whatever your preference. Sometimes it’s easier to throw in extracts, and they’re nice and potent. If you feel like doing the effort to zest, that’s the alternative. I hope that helps, and I’m sorry for the confusion! I’ll update the recipe shortly so that it’s more clear. Thank you!